One Senator's Solution for Health Care Expansion Senator Ron Wyden (D-OR) has worked tirelessly for health-care reform since the late 1960s. His latest effort, the Healthy Americans Act, attempts to provide health coverage for all Americans -– without dependence on employers. The fifth of a five-part series. Sen. Ron Wyden (D-OR) has introduced a bill that would guarantee all Americans the right to private health coverage. The legislation proposes that access to health insurance should not depend on an individual's employment. Expanding Coverage: Tax benefits and premium reductions written into the bill are designed to help citizens afford private health plans. Health problems, occupation, genetic information, gender and age will no longer be allowed to impact eligibility or increase insurance costs. Employers who currently provide employee health benefits will be required to convert their health-care premiums into higher wages. Employees can use these increased wages to purchase their own private health insurance. Promoting Competition: The bill relies on competition between insurers to drive down costs and promote quality. Individuals will no longer be grouped according to their employers, so in theory, the pool of health-care consumers will be expanded. State Coordination: Each state, with funding from the federal government and insurance companies, will establish a "Health Help Agency." Health Help Agencies will coordinate insurance payments from employers, individuals and the government. Focus on Prevention: The legislation's proposed system provides a financial incentive to insurance companies to keep their subscribers healthy; individuals will be more likely to stick with an insurer that is providing good preventive care. Subscribers will also be rewarded when they or their children successfully participate in wellness programs. It is expected that better preventive care will avoid spending taxpayer dollars on expensive visits to the emergency room. Adapted From: The Healthy Americans Act: How it Works, Courtesy of Senator Wyden's Office. Major social change often takes generations. It took 50 years for women to win the right to vote, and nearly 100 years to pass civil rights laws. So it is not surprising that efforts to establish a health-care system that covers all Americans haven't yet borne fruit. Still, many advocates remain motivated to work toward a goal they know may not be realized during their lifetime. Among the most tenacious health reform advocates is Sen. Ron Wyden, (D-OR). At a news conference in December, Wyden introduced the Healthy Americans Act — a bill three years in the making and his latest bill to provide every American with health insurance. And he sounded like a man in a hurry. "Health care has been poked and prodded and blue-ribboned and it is time for action," he told the crowd assembled in the cavernous hearing room of the Senate Finance Committee, where Wyden serves. Wyden, 57, has been pursuing action on health care since he was in college, when he took a job as a driver for then-Senator Wayne Morse. It was the summer of 1968, shortly after the Medicare program began. "As we drove around the state," Wyden remembers, "seniors would come up to Senator Morse and say, 'Senator, you've got to help me. I've had a big hassle with Medicare and haven't gotten paid. Could you give me a hand?' And Senator Morse would look at them and say, 'Well, Ron here's a bright young guy. He's going to help you out.' And I kinda thought to myself, gulped, said, 'How am I gonna do this?'" Wyden eventually did find ways to help. That sparked an interest in working with seniors to solve their health-care problems. 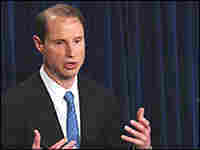 After he finished law school at the University of Oregon, Wyden founded a senior citizen law service that still operates today. He also co-founded the Oregon chapter of the Gray Panthers. One of the issues Wyden tackled early in his career was the sale of insurance policies that supplement Medicare coverage. "[These insurance policies] weren't worth much more than the paper they were written on," Wyden says. In many cases, the policies had benefits that duplicated Medicare, duplicated each other, or cost seniors more than they provided in benefits. Wyden worked for reforms and eventually successfully saw some passed in Oregon. In 1980, he was elected to the U.S. House and brought the fight to Washington, where he discovered that in health care, even the smallest of changes can take a lot of time and effort. He fought to require standardization of the insurance policies that supplement Medicare, so people could compare prices and benefits. "That was a long battle to drain the swamp," he says, "and year after year after year people in private industry said Western civilization is going to end if we have standardization and some reform. I think we made the case, but it took a decade." For much of his 15 years in the House, and 10 years in the Senate, Wyden has pursued incremental changes in the health care system. He has been willing to take small steps, he says, as long as they move toward a larger goal of covering more people and holding down health-care costs. He compares the health system to an ecosystem. "You do something in one corner and it fluffs up everywhere else," Wyden says. "I think the premium is always on trying to help as many people as possible now, but do it in a way that's consistent with sensible, long-term reform." Wyden did support the broad change proposed by President Clinton. But after that plan failed, he developed a new strategy: to lay low. "After 1994," Wyden says, "I think a lot of Americans looked at the federal government and said, 'I'm not sure those folks could run a two-car parade, let alone resolve what to do about one-seventh of the American economy, our health system," he said. But now Wyden is excited about a new window of opportunity. 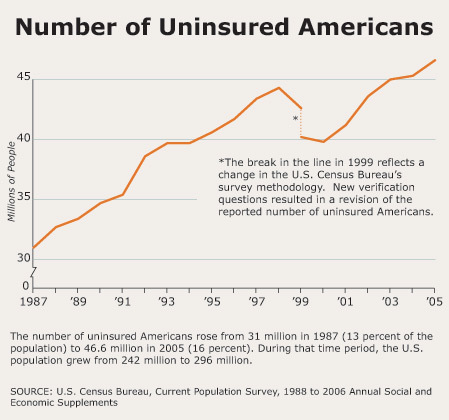 It is not just the public that wants health reform — it is the business community, too. Wyden says American businesses are competing against people around the world who essentially get health care for free; governments in other countries subsidize those workers' health care. "It's almost like our businesses are spotting the foreign competition 17 to 18 points on the very first day. We can't sustain that," he says. 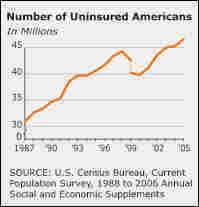 It's those sorts of statistics that helped drive Wyden's latest effort, the Healthy Americans Act. The bill would basically end the current system in which most Americans get health insurance from their employers. Wyden says that is happening anyway — he describes the employer-based system as "melting like a popsicle on a summer sidewalk." 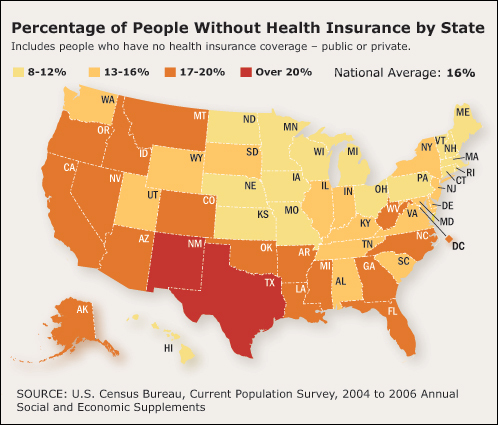 Instead, individuals would buy their own coverage — with financial help for those who cannot afford it. Len Nichols of the New America Foundation helped Wyden craft the bill. 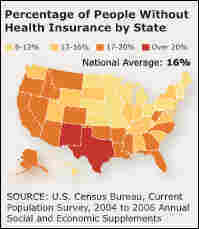 He says it is unlikely to pass this year, but it has been an important catalyst for the current health reform debate. "The conversations that are going on are laying the foundation for the future and that's really what it's designed to do," Nichols says. Nichols credits the Healthy Americans Act with prompting an "adult conversation" about the need for comprehensive reform of the health system. Wyden, however, says he wants Congress to act this year — not to wait until after the next election. "It just wouldn't feel right to me," he says. "When I see people coming to those town hall meetings, people in their 50s, saying, 'I just hope my employer can hang on to coverage until I get Medicare,' that's what energizes me, that's what makes me say, 'It's not something that ought to wait any longer.'"